Pandit Dhananjay Kaul accompanied by Bhavesh Patel on the tabla. Photos by Tracy Marshall. Atlanta, GA, August 1, 2017: Pandit Dhananjay Kaul, the Sufiana maestro from India performed to a standing ovation at a recent music concert at the Impact Center of Global Mall in metro Atlanta. 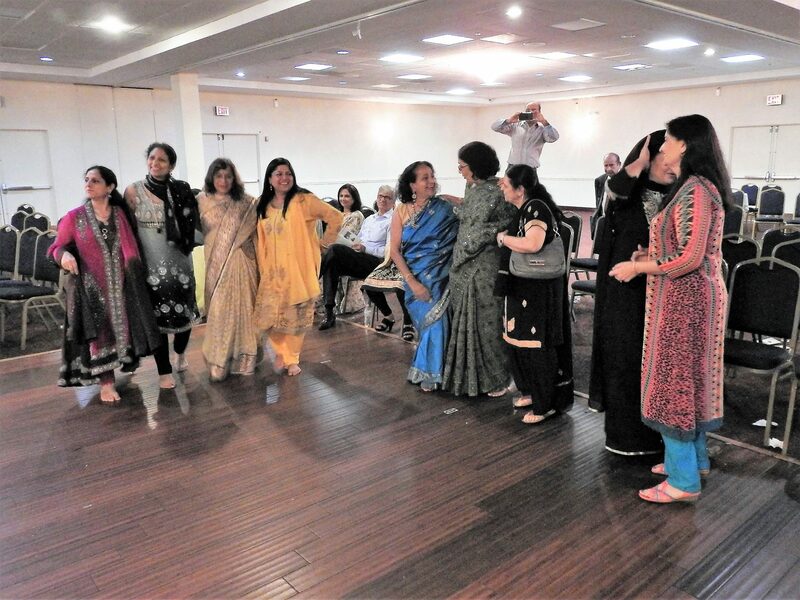 The charity concert held on Sunday evening, July 16, 2017 was a well-organized feast of dinner and music to benefit plans for construction of a replica of Kheer Bhawani USA temple in Atlanta. After a sumptuous dinner, introductions and a brief presentation of bouquets by the leaders of the community, emcee for the concert Subash Razdan (a Kashmiri from Ahmedabad), welcomed the maestro. Honorable D.V. Singh, Dy. Consul General of India in Atlanta, Sachid Shukla and his team of Shiv Mandir Atlanta (a 501-c-3 tax-exempt non-profit organization) brought in their respective greetings for the accomplished artist in their special remarks. It is noteworthy and encouragingly auspicious news for Hindus of Georgia that Shiv Mandir also had its own successful ground breaking for construction a few weeks earlier. Tej Kaul of Kashmir Overseas Association (KOA), an architect by profession, took the opportunity to explain the efforts already underway with respect to the planning and design of the Kheer Bhawani USA temple within the 11.4 acre premises of Shiv Mandir Atlanta in the northeast corridor of Metro Atlanta. Pandit Dhananjay (in the middle) is flanked by his admirers/fans of Atlanta. “The tranquil temple in Kashmir, which shines like a pearl in the shell, has a marble platform with idols inside and under the marble canopy in the middle of the spring. And this is what Kashmiris overseas are hoping to replicate along with allied festivities in Atlanta with support from Shiv Mandir Atlanta!” explained Tej Kaul of KOA-GA.
Kashmir’s Kheer Bhawani is the most venerated temple dedicated for Maa Ragnya Bhagwati (another form of Durga) at the holy spring in Tula Mula about 15 miles from Srinagar. “The Goddess is viewed as central in Shakti and Shaiva Hindu traditions. Kheer (porridge/pudding) is offered to the sacred spring (Kund) in worship (puja) as a tradition, hence the name Kheer Bhawani. The holy spring surrounding the majestic temple is reported to change its color with various hues of red, pink, orange, green, blue, white, etc. A black tint of the spring water is believed to be inauspicious by the superstitious,” added Dijjotam Raina a supporter and sponsor of the concert to benefit Kheer Bhawani project in Georgia. The spotlight for the evening nevertheless was on Pt. Dhananjay Kaul of India as the stage with backdrop and decorations typical of Kashmir was set for his florid vocalism. Trained in Patiala & Shyam Chaurasi gharanas (styles) and recipient of numerous State and National awards, Dhananjay’s gayaki (singing) is cast in devotional mould and his voice is full-throated and bold with beautiful tapestry of Swaras and Shrutis. The leading exponent of music is known to embellish his renderings with a blend of Sufiana (devotional music of the Sufis-Islamic mystics) music and the genres of Indian classical vocal music with thumri, kafi, sufiana kalams, ghazals, Sanskrit stotras, etc.. Clad in intricate Kashmiri Jaamwar shawl, the Pandit invoked Lord Shiva with the classical bhajan (devotional) recital by a Sanskrit stotra in raag/raga (melodic mode with atleast five notes providing a musical framework) Bhairav with his nifty fingers controlling the keys of his harmonium (the piano like instrument) with a slow melody. The pace became faster and the texture more intense with fugue-like entrance by the Tabla played by Bhavesh Patel of Atlanta (a student of Pandit Shree Divyang Vakil – disciple of Ustad Allarakha Khan). His second striking melody, the Kashmiri sufi kalam (song) “Roz roz”, set a lighthearted tone to the raga. The mood became more dramatic and electrifying as it progressed with the unflinching broad scale rendering by his vocal chords in a sustained high-pitched ethereal voice. Dancing to Kashmiri folk song, Bhumro. It was now time for some Sufiana ghazals. Ghazal is a poetic verse of Urdu language in which ‘an idea is fully expressed in a single line divided into two hemistiches of equal syllabic lengths and with rhyming words at the end of the second hemistich’. Dhananjay enthralled the audience with the compositions of singer Mehdi Hasan including the ghazal of Ahmed Faraz, “Ranjis hi Sahi” in raag Yamen followed by “Zindagi mei to pyar” in raag Bhimpalasi. He also sang a few other popular ghazals in raga Khamaj and Kafi. Reviving thoroughly the great memories of the legendary Mehdi Hasan! The repertoire and diversity of his renditions now shifted to Hindustani classical, singing a nostalgic thumri of Ustad Bade Ghulam Ali Khan in raag Kaushik dhuni. The crescendo heightened when Dhananjay sang Punjabi sufi kalams “Nit khatr mangan” in raag Megh and Baba Bhule Shah kalam (song) “Mera piya ghar aya” in raag Pahadi. The audiences broke into spontaneous dance and ovation for his Punjabi/Patiala gharana beats with the climax being “Bhumro Bhumro”, a Kashmiri folk song adapted by Bollywood film “Mission Kashmir”. He continued entertaining with the famous Kashmiri Sufi kalam of great Saint Ahad Zargar, “Na chum tan pan” in raga Bilawal. The interplay between the alternating harmonium and the resonating tabla created an interesting dialogue especially with the rendering of Nusrat Fateh Ali Khan’s, “Dum mast qalandur” in raag Kafi. On popular demand and as requested by Jyoti Ganju (one of the organizers of the concert), his final song for the evening was a patient, minimalist lyrical rendition of Kashmiri sufi kalam by great Saint Niyma Saeb, “Che gaste hai” in raag Khamaj. The charity concert, which sold out with an attendance of over 200 expatriates, raised over $20,000 (total collections so far) for the Kheer Bhawani USA Temple Fund. “The Concert drew the diverse music loving Atlanta audience of Hindustani classical, Sufiana music and above all the Kashmiri music lovers of all colors and faith. A few of his prominent renditions were also streamed concurrently online on Facebook,” reported Surinder Dhar of KOA-Ga.
Over 300,000 Hindus of the Kashmir Valley, a large majority of whom were Kashmiri Pandits (the name Pandit reportedly given to the intelligent/learned Saraswat Brahmins of Kashmir by the Moghul ruler, Akbar) were forced to flee the Valley in 1989-90 as a result of terrorism and with hundreds killed. Many who fled for their lives, their homes usurped, plundered, burnt and destroyed, could only take with them what they could fit in their handbags. As per some 2016 reports, only 2764 Kashmiri Hindus were left behind in vulnerable and unsafe conditions of Kashmir Valley since the last round of ethnic cleansing of 1990. Kashmiri Hindus settled in USA and elsewhere have naturally united to commit and dedicate themselves to assist the displaced Kashmiris uprooted and lamenting in the refugee camps (in Jammu, Delhi and other neighboring states in India) away from their homes in Kashmir and have strived to help contribute towards the cause of the education, sustenance and well-being of their kin in those pathetic camps in India. Additionally, those Kashmiris who have willingly migrated (before and after 1990) and settled in USA have also experienced the usual challenges of the cultural separation, language and differing family value system associated with the human transplanting from the world left behind into the new environs. To alleviate such socio-cultural-religious imbalances and maintain continuity with their heritage, the Kashmiri Hindu community in USA, like any other community, hopes and is passionate, among other things, about preserving their ancient and rich Kashmiri Hindu culture, language, music, education, history, that includes conscious religious identity with the wonderful ancient shrines of Kashmir such as the shrine of Mata ‘Kheer Bhawani’. Thus the desire, need and the case for Kheer Bhawani USA in Atlanta! “Although a tall order considering the small number (approx 30 families) Kashmiri families in Georgia, the optimism, will and enthusiasm arising out of this successful Concert shall positively serve as a stepping-stone in that direction and is bound to nudge the Kashmiri community across USA (enough to provide the necessary critical mass) to unite towards the establishment of Kheer Bhawani USA,” reaffirmed Dr. K.K. Vijai, pioneer of Indo-Atlanta community and one of the significant, sponsors of this recent concert in Atlanta. K.K. & Girija Vijai have vivid memories of their visit to Kheer Bhawani/Kashmir many years ago before the outbreak of the violence. 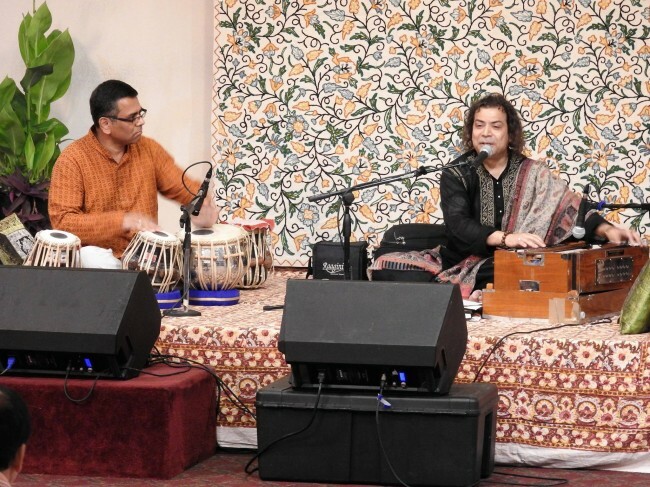 “Dhananjay concert in Atlanta, and elsewhere in US, from all accounts seem to be a philosophical success, as the maestro rendered Kashmiri songs with lyrics and spirit of Kashmiriyat in the earnest hope of return of peace and tranquil in the Kashmir valley,” beamed Dr. Shakun Malik, President of the national Kashmiri Overseas Association (KOA). 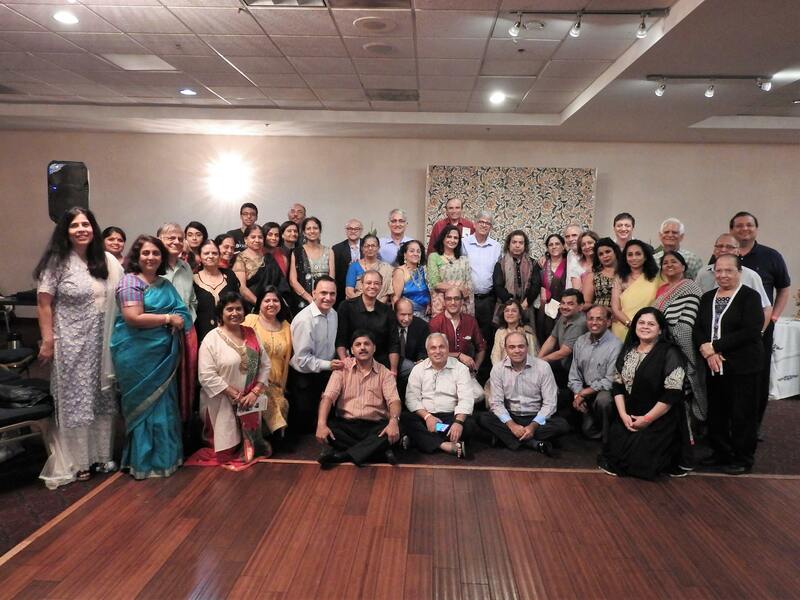 Dr. Malik, Suresh Sus and other members of her KOA team had inspired and facilitated the successful Music tour 2017 of USA for the maestro from Kashmir. Acknowledgments: All the attendees; sponsors/donors; Media; Dinner by Aziz Ali of Ashiana at Global Mall; Printing by Sanjay Pandya of Davis Printing, and so many others.